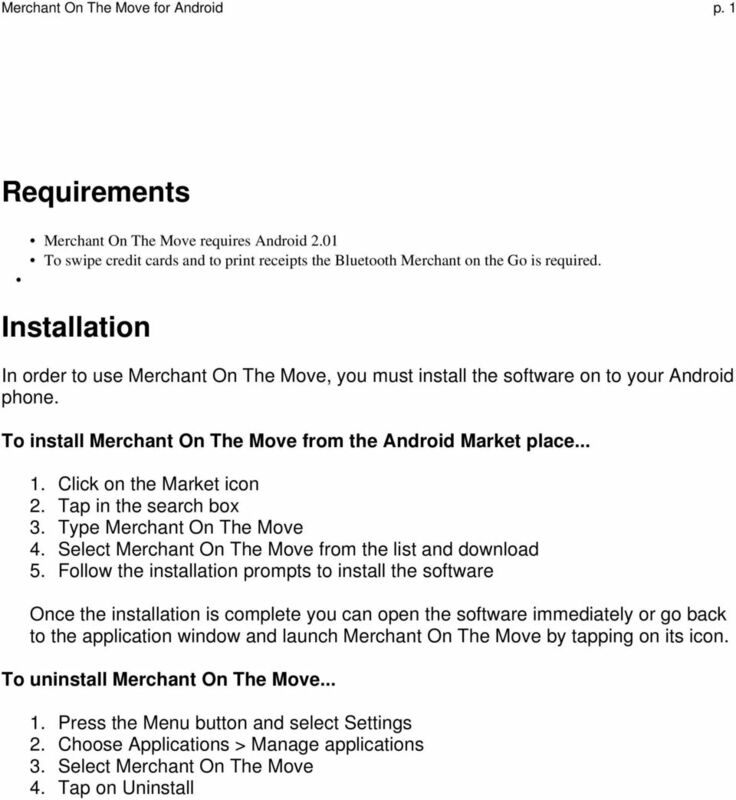 Download "Merchant On The Move Android Professional Edition User Guide and Tutorial"
5 Merchant On The Move for Android p. 3 Entering your merchant account Activating your software Modifying your account settings Optionally setting up your Bluetooth Merchant on the Go 1. Locate the Merchant On The Move icon and tap on it 2. Enter your Merchant ID (MID) and Password (PWD) on the Merchant Account Logon screen The MID and PWD are the same as your online merchant logon information. The password must be in uppercase (if you did not make your password to uppercase when setting up your online account, you must do so before trying to setup your account inside Merchant On The Move). In this example MID and PWD 1234 are used for a company called MAC Tools. 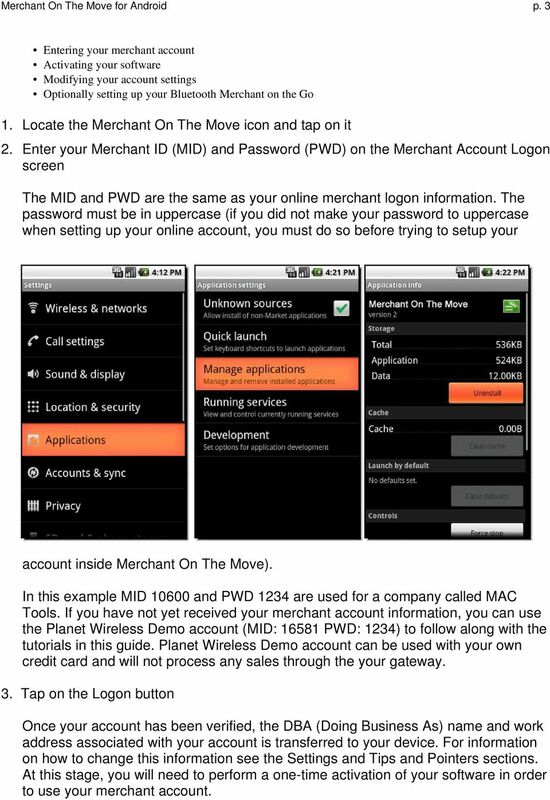 If you have not yet received your merchant account information, you can use the Planet Wireless Demo account (MID: PWD: 1234) to follow along with the tutorials in this guide. 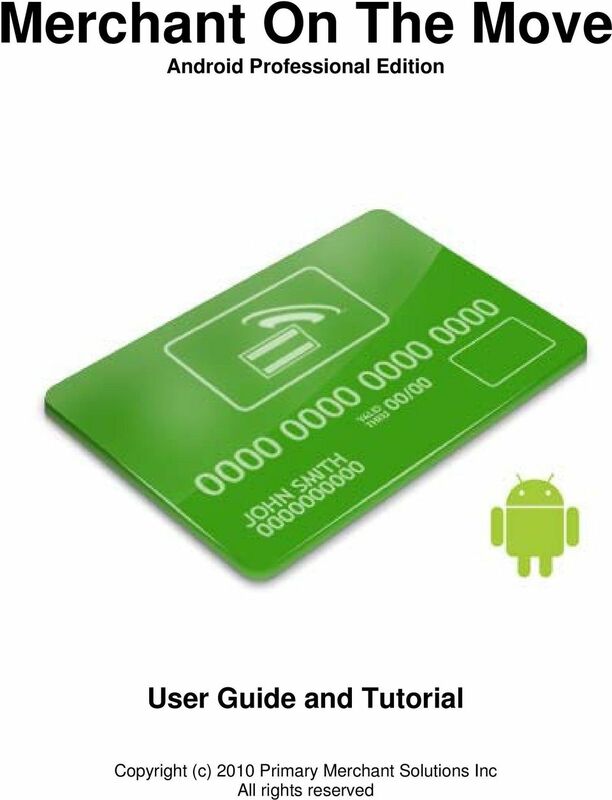 Planet Wireless Demo account can be used with your own credit card and will not process any sales through the your gateway. 3. Tap on the Logon button Once your account has been verified, the DBA (Doing Business As) name and work address associated with your account is transferred to your device. For information on how to change this information see the Settings and Tips and Pointers sections. At this stage, you will need to perform a one-time activation of your software in order to use your merchant account. 6 Merchant On The Move for Android p Enter your 16 digit activation code The activation code is provided by your merchant provider. This is a 16 digit code that you must enter before you can start using your merchant account on the device. The Planet Wireless test account (16581) does not require software activation. 5. Review your settings Once the software is activated, you will be taken to the settings screen were you can modify some options. Information regarding each of the settings can be found in the Settings section. If you would like to make changes, please review each section, particularly the name of your company. If your company name (DBA) is not correct, you will need to notify your merchant provider and issue a change notification. To update your DBA name on the device, see the Tips and Pointers section. If you want to follow along with the same information used in this guide, set the sales tax rate to either 8.25% and use the test account (PLANET WIRELESS DEMO). Keep the Always Add Sales Tax option unchecked. 6. Tap the back button on your device As with most Android applications, the back button will close the virtual keyboard, close dialog boxes, or return you to the previous screen. 7 Merchant On The Move for Android p. 5 In this case, the back button will exit the Settings screen and bring you to the Main Menu (see the Main Menu section for details). Tapping the back button a second time will exit the program. 7. Tap the back button a second time to exit the program Your first time setup is complete. From now on, each time your start Merchant On The Move you will be asked to log on before going to the Main Menu. At this point, if you have purchased and received the Bluetooth Merchant on the Go, go to the section Bluetooth Setup for pairing and setting up your 2-track card reader and receipt printer. 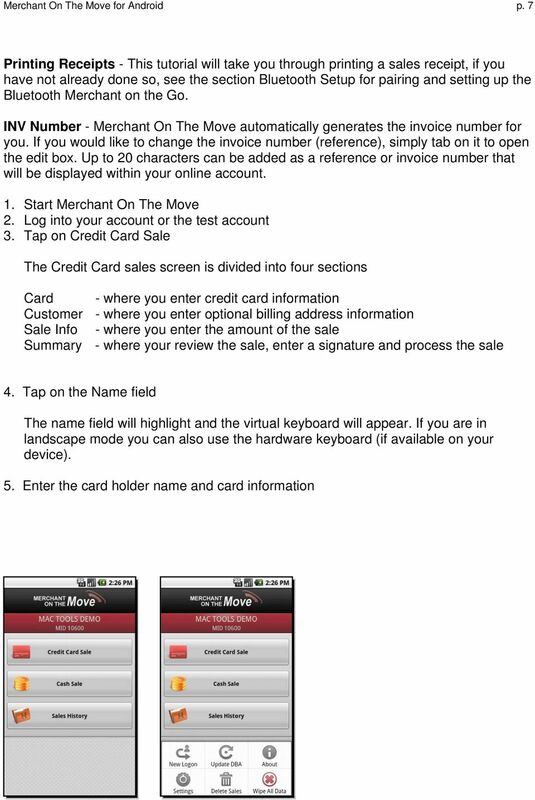 Logging on to Merchant On The Move Each time you start Merchant On The Move, you are presented with the Merchant Account Logon screen. The most recent account accessed will appear in the MID field. If you have used more than one account the drop down arrow will display a list of validated merchant accounts. You can use this list to switch between merchant accounts. If the Save Password option is checked on in the settings screen, then the password field will also be populated. 8 Merchant On The Move for Android p. 6 If you leave the Save Password feature on (by default) it is recommended that you invest into a software utility that can lock your screen so that if you lose your device, it cannot be accessed by others. In addition, each merchant account has it's own unique settings that can modified from the Settings screen (i.e., Rep ID, header and footer for printed receipts). These are known as local settings (see the Settings section for details). Main Menu After logging on to your account the Main Menu allows you process sales, issue returns from the Sales History, and perform other tasks available from the popup menu. 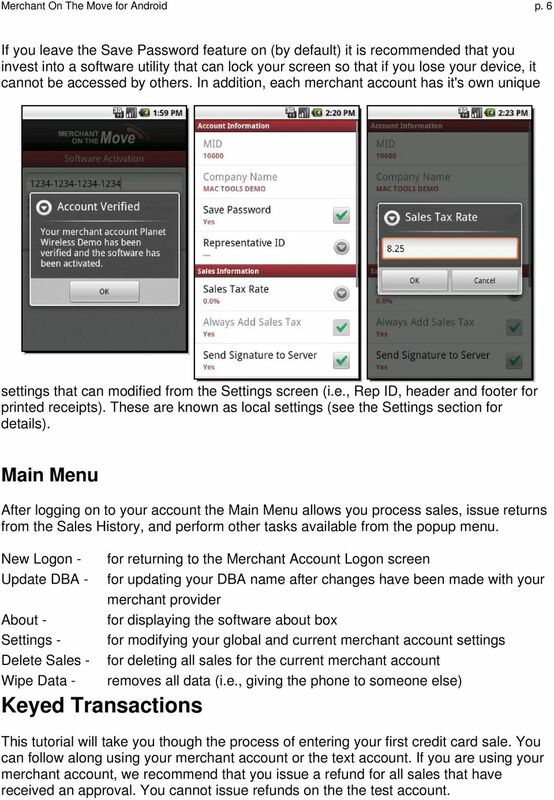 New Logon - Update DBA - About - Settings - Delete Sales - Wipe Data - Keyed Transactions for returning to the Merchant Account Logon screen for updating your DBA name after changes have been made with your merchant provider for displaying the software about box for modifying your global and current merchant account settings for deleting all sales for the current merchant account removes all data (i.e., giving the phone to someone else) This tutorial will take you though the process of entering your first credit card sale. 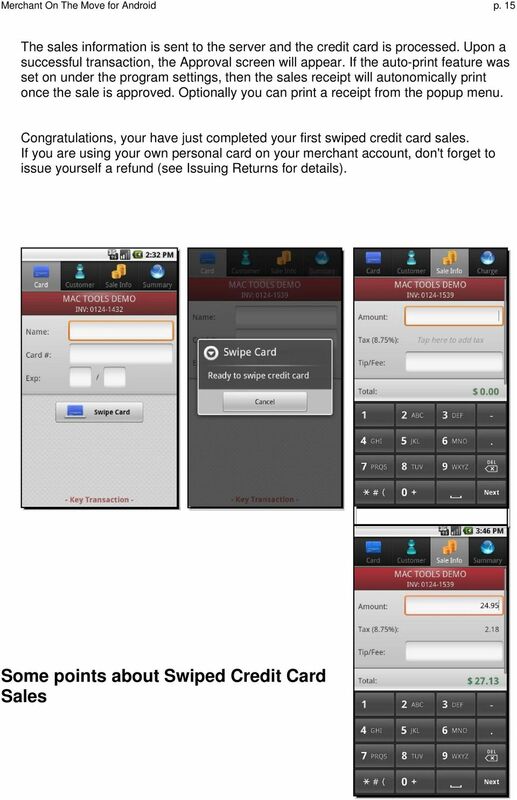 You can follow along using your merchant account or the text account. If you are using your merchant account, we recommend that you issue a refund for all sales that have received an approval. You cannot issue refunds on the the test account. 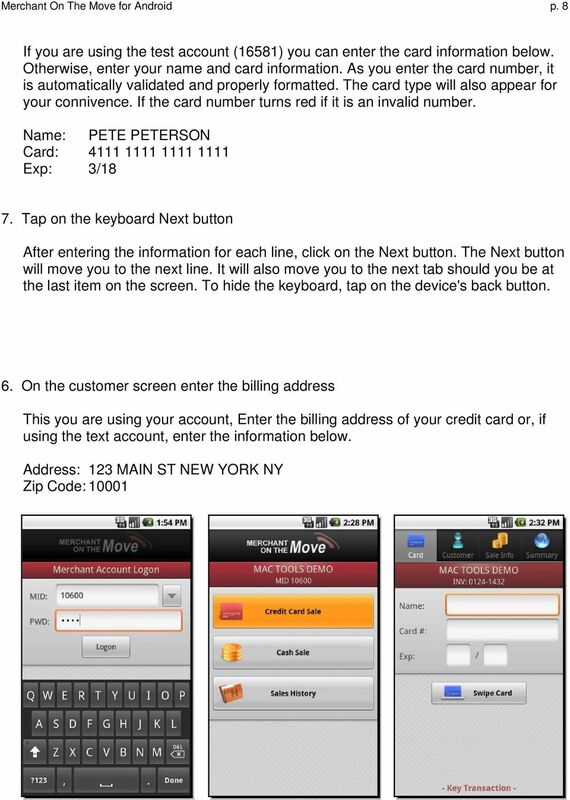 11 Merchant On The Move for Android p. 9 Billing information is optional and will not be displayed on the printed receipt. However, if your merchant account is setup for AVS (Address verification), entering the information in these fields for a keyed transaction may reduce your merchant processing fees and aid in contesting any chargebacks. 7. 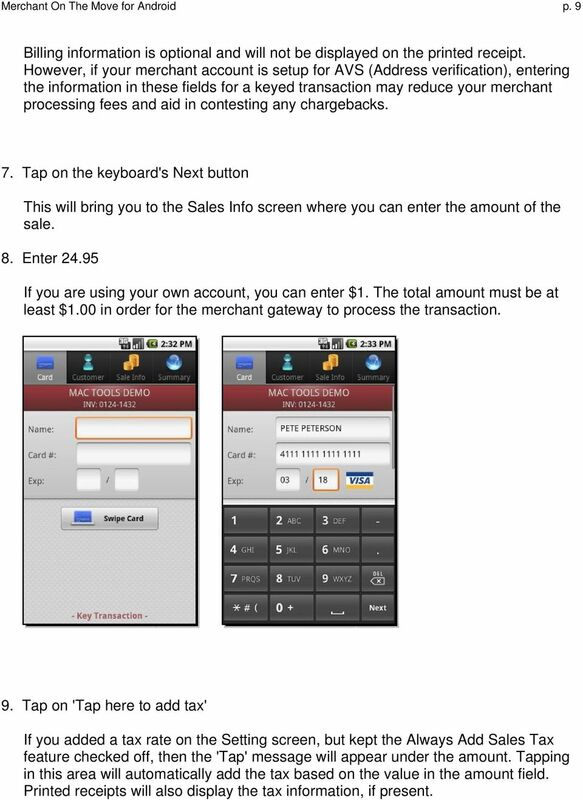 Tap on the keyboard's Next button This will bring you to the Sales Info screen where you can enter the amount of the sale. 8. Enter If you are using your own account, you can enter $1. The total amount must be at least $1.00 in order for the merchant gateway to process the transaction. 9. Tap on 'Tap here to add tax' If you added a tax rate on the Setting screen, but kept the Always Add Sales Tax feature checked off, then the 'Tap' message will appear under the amount. Tapping in this area will automatically add the tax based on the value in the amount field. Printed receipts will also display the tax information, if present. 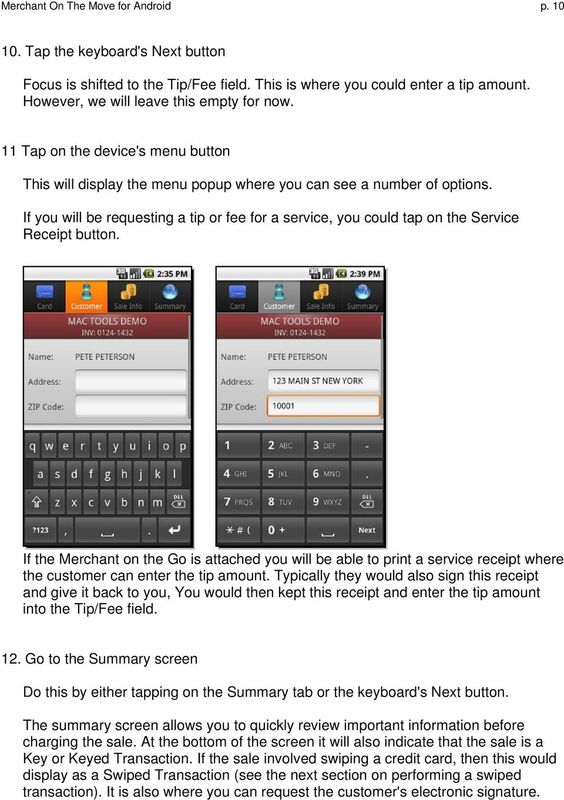 12 Merchant On The Move for Android p Tap the keyboard's Next button Focus is shifted to the Tip/Fee field. This is where you could enter a tip amount. However, we will leave this empty for now. 11 Tap on the device's menu button This will display the menu popup where you can see a number of options. If you will be requesting a tip or fee for a service, you could tap on the Service Receipt button. If the Merchant on the Go is attached you will be able to print a service receipt where the customer can enter the tip amount. Typically they would also sign this receipt and give it back to you, You would then kept this receipt and enter the tip amount into the Tip/Fee field. 12. Go to the Summary screen Do this by either tapping on the Summary tab or the keyboard's Next button. The summary screen allows you to quickly review important information before charging the sale. At the bottom of the screen it will also indicate that the sale is a Key or Keyed Transaction. If the sale involved swiping a credit card, then this would display as a Swiped Transaction (see the next section on performing a swiped transaction). It is also where you can request the customer's electronic signature. 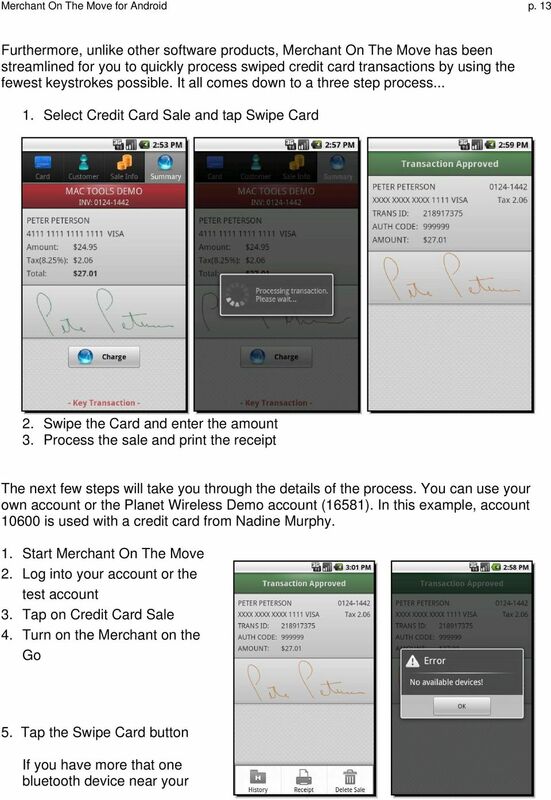 13 Merchant On The Move for Android p. 11 The electronic signature is different from the Service Receipt signature. The Service Receipt signature is for you to file with your business and sales papers. Should there be questions about the amount that was changed or the customer contests the amount entered for the tip, you will have this information readily available. The electronic signature is sent to your merchant gateway and stored on the server. Should your require proof that the customer authorized the sale, you can log into your online gateway and print the processed receipt (with signature) from your browser (note: depending on the merchant gateway you are using - you may need to use the Internet Explorer Web browser to view the signature). To make use of server-side signature storage, this feature must be set to on under the Settings (see the Settings section for details). 13. Tap on the 'Tap here to enter signature' Turn the device sideways and pass it to the customer. 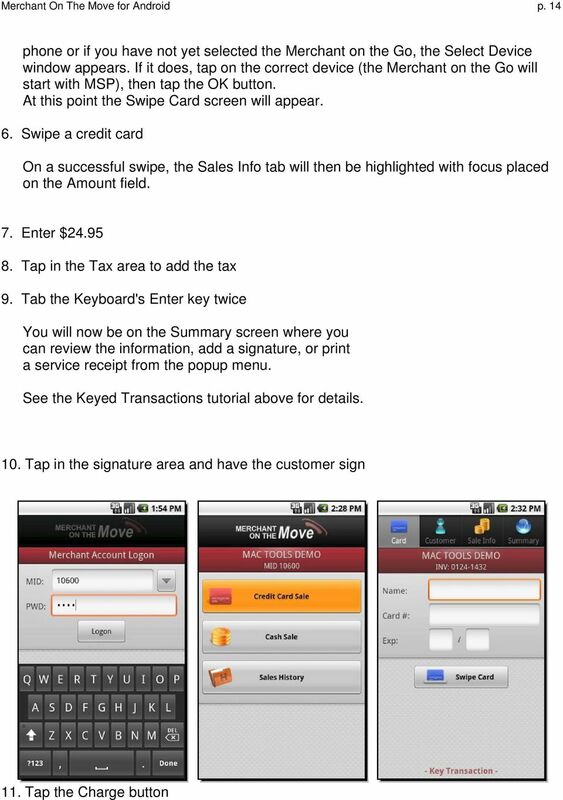 Ask the customer to enter their signature, then tap on the OK button. The signature will now appear on the Summary screen. 14. Tap the Charge button A secure internet connection will be established and the sale will be processed. Once the sale is approved, an Approval Screen will appear and the signature will change to a different color, indicating that it can no longer be changed. 14 Merchant On The Move for Android p Tap the device's menu button The popup menu button will appear, where you can now print a final receipt with the transaction ID and authorization codes returned from the merchant gateway. If you have set Auto Print Approved Sales to on from the Settings, then a receipt will automatically be printed once the sale is approved. 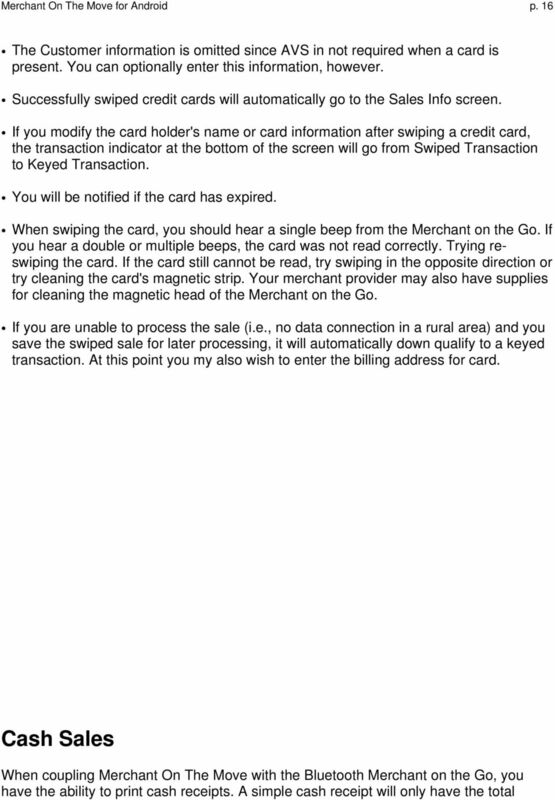 If the Merchant on the Go is off at this point, then the No available devices error message will appear. At this point you can turn on the Merchant on the Go, tap OK to dismiss the error message and press the Receipt button from the pop menu. You have just completed your first Keyed Transaction. Swiped Transactions By using the Bluetooth Merchant on the Go you can use Merchant On The Move to perform swiped transactions that give you the best processing rates. Swiped transactions are fast and secure. Address verification is not required and you do not have to spend time manually entering the credit card information. 19 Merchant On The Move for Android p. 2 amount of the sale. Detailed cash receipts can display the tax and tip amounts. Service receipts can also be printed from the popup menu. To print a simple receipt where the customer enters a tip From the Main menu tap on Cash Sale 2. In the General tab enter an amount 3. Tap on the device's menu button to display the popup menu 4. Tap the Service Receipt button To print a detailed receipt where the tax and tip are placed on the receipt From the Main menu tap on Cash Sale 2. Tap on the Detailed tab 3. Enter an amount (i.e., $52.00) 4. Optionally, tap on the Tax area to add or remove the sales tax 5. 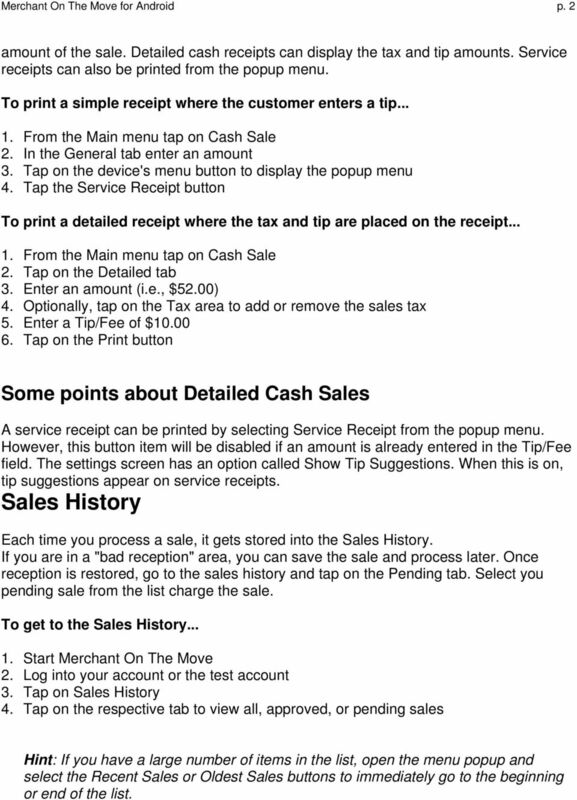 Enter a Tip/Fee of $ Tap on the Print button Some points about Detailed Cash Sales A service receipt can be printed by selecting Service Receipt from the popup menu. However, this button item will be disabled if an amount is already entered in the Tip/Fee field. The settings screen has an option called Show Tip Suggestions. When this is on, tip suggestions appear on service receipts. Sales History Each time you process a sale, it gets stored into the Sales History. If you are in a "bad reception" area, you can save the sale and process later. Once reception is restored, go to the sales history and tap on the Pending tab. Select you pending sale from the list charge the sale. 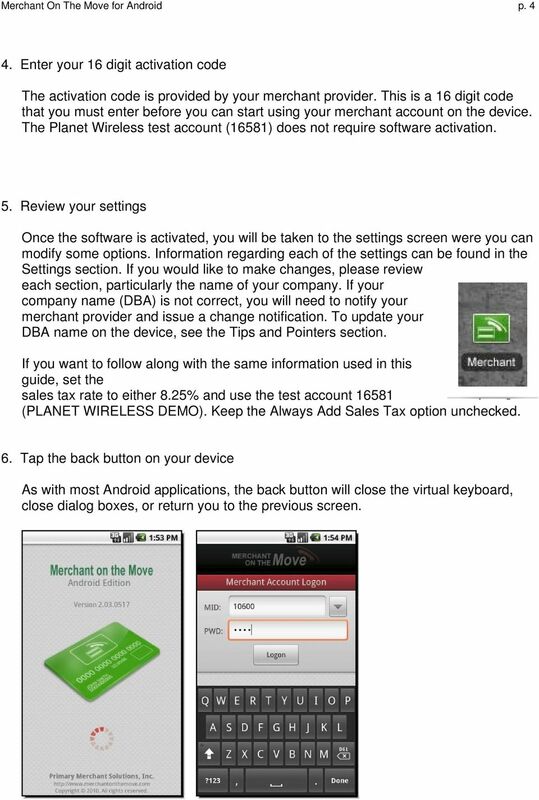 To get to the Sales History Start Merchant On The Move 2. Log into your account or the test account 3. Tap on Sales History 4. Tap on the respective tab to view all, approved, or pending sales Hint: If you have a large number of items in the list, open the menu popup and select the Recent Sales or Oldest Sales buttons to immediately go to the beginning or end of the list. 21 Merchant On The Move for Android p. 4 your online service, we recommend that you delete the sale from your sales history on the device. Trying to issue a refund on a sales item that was already taken care of online will display a notification error, suggesting for you to delete the sale. 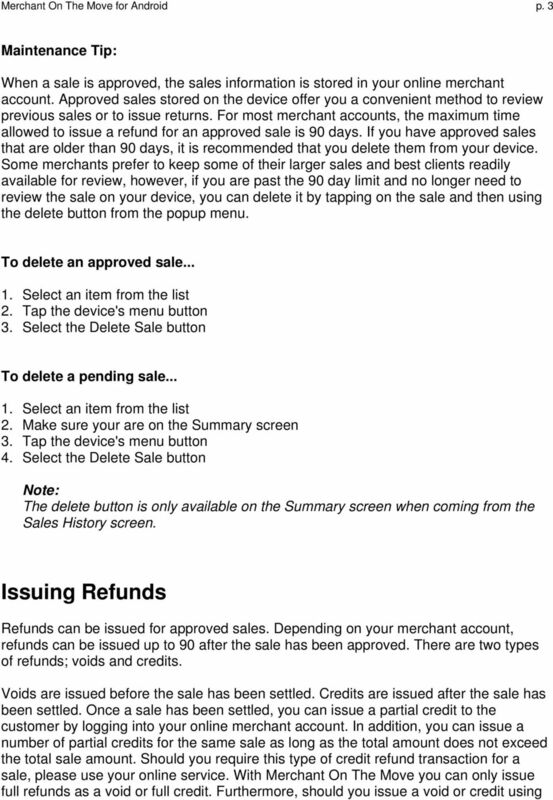 Sales items that are issued a refund in Merchant On The Move are automatically removed from the sales history list. To issue a refund Start Merchant On The Move 2. Log into your account or the test account 3. Tap on Sales History 4. Tap on the All or Approved tab 5. Select the approved item to refund from the list In this example we have a single approved sale from a previous tutorial by Pete Peterson for $ Tap on the Issue Full Refund button A connection to the gateway will be established and validate the sale. After validation, it will check its status and see if a refund can be issued, issue the refund, and display a message indicating wether a void or credit was issued. 7. Tap on OK to dismiss the message You are then brought back to the Sales History screen and the item you selected is removed from the list. Should you wish to review the refund, log into your online merchant account. 24 Merchant On The Move for Android p Resetting the Merchant on the Go 2. Pairing the Merchant on the Go with your device 3. 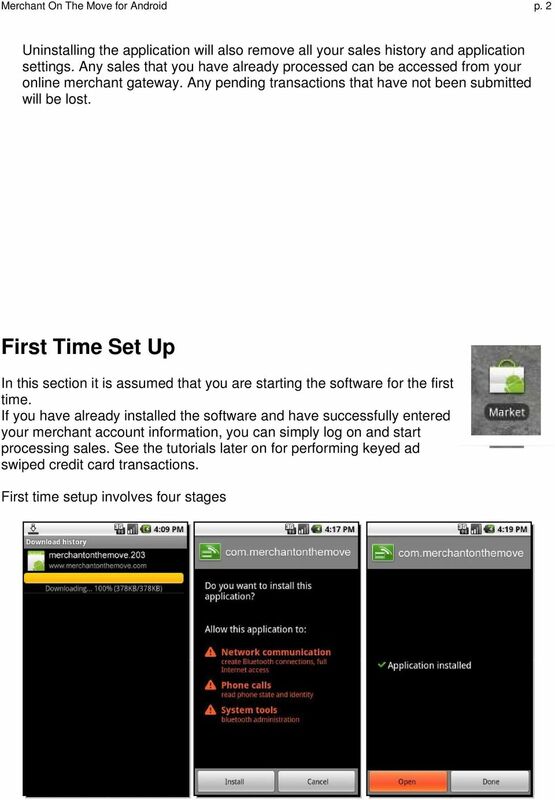 Finalizing the pairing and selection process To start the process follow these steps... Resetting the Merchant on the Go 1. 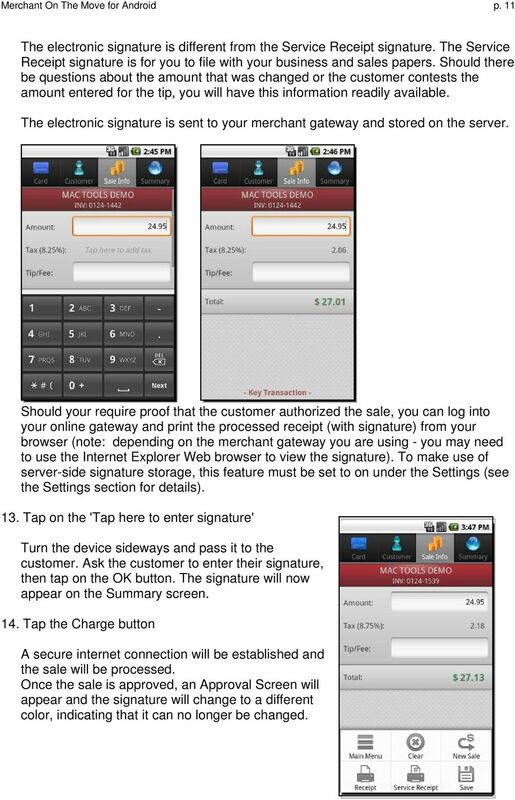 Turn the Merchant on the Go off (if it is already on) 2. Press and hold the ON button for three seconds 3. Once the diagnostic sheet starts printing, release the ON button The Merchant on the Go is now ready to be paired with your device. 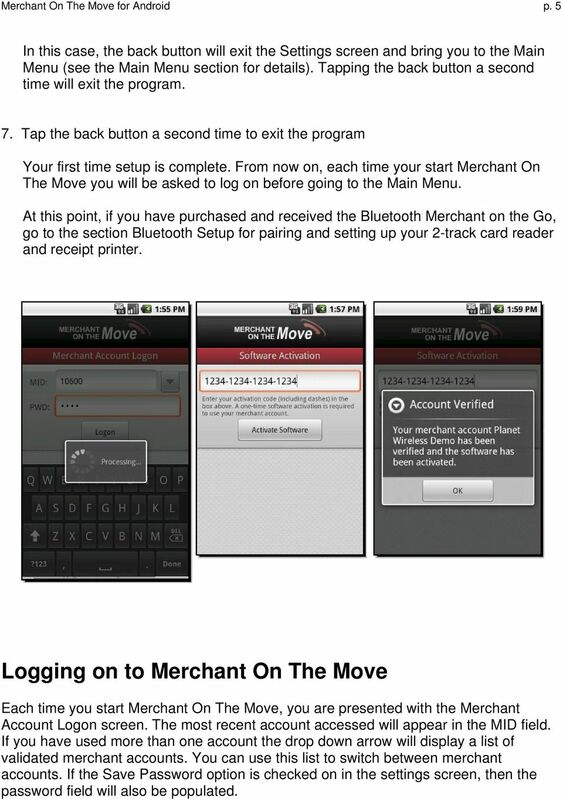 Pairing the Merchant on the Go with your device 1. Turn on your Android Phone 2. Make sure you are on the home screen (no applications are open) 3. Tap on the device's menu button to open the popup menu 4. Tap the Settings button 5. Tap Wireless & Networks then Bluetooth Settings 6. If Bluetooth is off, turn it on (1st item on the list) 7. Tap Scan for Devices 8. When the the device starting with MPS appears, tap on it to pair 9. Tap on Pair & Connect 10. 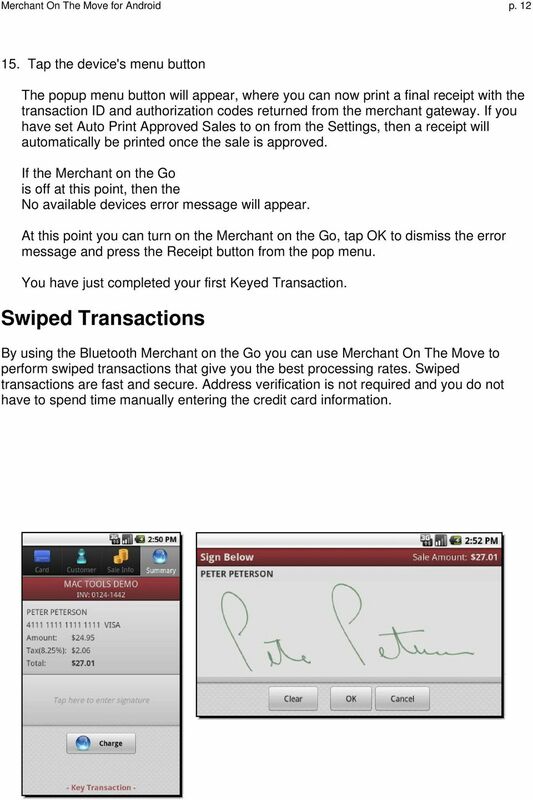 In the Bluetooth paring request type the PIN number: Tap OK The Merchant on the Go will now be paired but not connected. In step nine you should see a device starting with MPS (for example MPS909004). If you do not, make sure the Merchant on the Go is on and fully charged (see the Merchant on the Go documentation for details on how to charge the device). Should you have trouble with the paring process (step 11) or a message appears saying that the passcode in not correct, please try again. The passcode is If the passcode still does not get accepted, make sure that the Merchant on the Go is fully charged, then reset the Merchant on the Go and try again (note that multiple resets and attempts may also drain the battery significantly). Importantly, only managers with security clearance can access this section.